This protein-packed breakfast is sure to be a favorite for everyone in your house – simply because it is so easy to add or take away whatever you like! Plus, it’s healthier than sugary cereals, any day! Mix eggs and milk in medium sized bowl. Over med-high heat, add butter to skillet and melt. Sauté desired vegetables and set aside. Add in eggs, stirring until cooked, but still glossy. Add in your choice of meat and continue stirring until eggs are cooked. 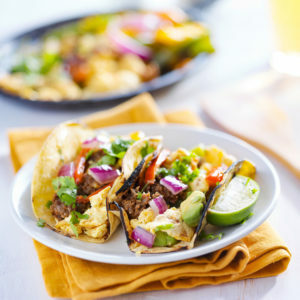 Take ¼ of egg mixture and add to each tortilla. Top with shredded cheese and vegetables.